The once mighty Reds stumbled and stuttered along for yet another season in 2018. Their long-suffering fans hoped, prayed, and dreamt of a better year, but it was not to be. Played 16, won 6, lost 10, and fourth in the Australian Conference, 13th overall, and that is about all she wrote. The single biggest issue that plagued the Reds was a porous defence, with no apparent and consistent plan and almost zero execution. Their entire game seemed to be based on a lack of consistency. They did produce a fairly effective pack of forwards, built around the young Taniela Tupou, the Tongan Thor, who provided remarkable scrummaging power and was used as their go-to man for crashing the ball up the middle. But one man does not make a team, and his relative youth and inexperience allowed the more experienced props in the game to negate his immense power with technical expertise. The Reds’ discipline was again something of a problem, an area that Brad Thorn will have to focus on if the Reds are to improve in 2019. Scrum Coach: Cameron Lillicrap, dual role as Reds’ physiotherapist. Strength and Conditioning Head Coach: Brynley Abad. The experience of George Smith will be missed, as there seems to be no successor to take his No7 jersey. The departure of Izaia Perese is another blow to the Reds as he had the potential to be real star had he stayed in the game of rugby union. Jono Lance, Eto Nabuli and Ben Lucas are yet more experienced heads that are leaving, along with the likes of James Slipper. Karmichael Hunt and Quade Cooper are finally leaving for other Super Rugby squads, but this doesn’t come across as much of a loss as neither were going to be seen in a Reds jersey while Brad Thorn is coaching the team. Sef Fa’agase, Andrew Ready and Kane Douglas, Michael Gunn, Reece Hewat, Markus Vanzati, Lachlan Maranta and Jayden Ngamanu have also left the squad. Brad Thorn has continued with his focus on developing and rewarding hard-working youngsters with the signings of Gavin Luka, Efi Ma’afu, Fraser McReight, Harry Wilson, Jock Campbell and Will Eadie from the NRC. He has also signed a Kiwi flyhalf in the form of Matt McGahan, coming from Japan. The biggest signing is perhaps the pace and finishing ability of Sefa Naivalu from the Rebels. The arrival of Sefa Naivalu gives the Reds some excellent options out wide in attack, alongside the exciting young talent Jordan Petaia. With Samu Kerevi in the midfield, together with ex-Waratah Bryce Hegarty, the Reds may just have a competitive back division again. Much revolves around their halfback pairing and whether they can find some consistency through the season. If neither the 9 or 10 can impose themselves on the game, it will not make any difference whatsoever who they have in the midfield and out wide. In the forwards the Reds have the brute force of Tupou, together with the likes of Brandon Paenga-Amosa and Izack Rodda. If this trio can spark the rest of their forwards through the season, then the Reds could be in for some improvement. The Reds’ defence was a major problem last season. 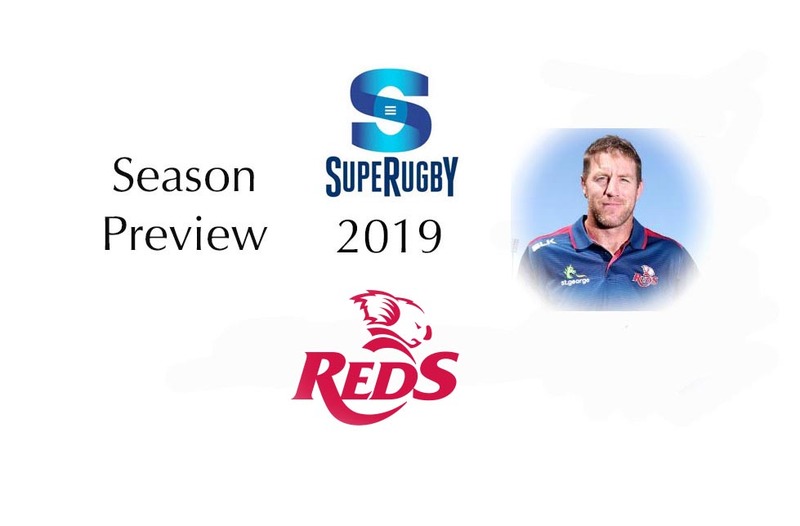 Looking back at the 63 points they conceded against the Sunwolves, one must suggest that their primary focus for 2019 is to improve this aspect of their game. It does not matter who you have on the wing, if you allow the opposition to run through the revolving doors of your midfield.